Last year, my kids and I went to the theater to see the movie "Bears" on opening day. We totally loved it, and we're looking forward to seeing “Monkey Kingdom,” a new Disneynature movie about Maya, a clever and resourceful blonde-bobbed monkey. This new film is set among ancient ruins in the storied jungles of South Asia. Maya’s world is forever changed when she welcomes her son, Kip, into her complicated extended family. Like all families, Maya’s has more than its share of colorful personalities—and she’s determined to give her son a leg up in the world. When their longtime home at Castle Rock is taken over by powerful neighboring monkeys, Maya's whole family is forced to relocate, where she uses her street smarts and ingenuity to lead them to untapped resources amidst strange new creatures and unsettling surroundings. Ultimately, they will all have to work together to reclaim Castle Rock, where Maya can hopefully realize her dreams for her son’s future. .For more information about the film and the conservation program, go to www.disney.com/monkeykingdom. School is out and parents everywhere are looking for fun and cheap things to do with their kids this summer. In previous years, I put together a list of free and cheap summer movies across America. I've updated the list for Summer 2014, and I hope you find some movies in your area! Bow Tie Cinemas Free Sumer Film Series - Tuesdays and Wednesdays at 10am - Seating starts at 9:00 am Absolutely Free Admission! Cinema World's Summer KidFest - Free films, seven days a week, all summer long! Every day at 10am. Children are FREE. Adults are just $2 or FREE with a donation (see site for details). Cinemark's Summer Movie Clubhouse - Showing 10 films for $5, if purchased in advance, or just $1 per show. Classic Cinemas - Wednesday morning movie series are just $1. Now through August 6th. Flagship Cinemas - Camp Flagship offers free summer movies for kids. Georgia Theater Company - Checkout these $1 Movies every Tuesday and Thursday Morning. Harkins Summer's Movie Fun - Kids can enjoy a movie a week for 10 weeks, for less than $1 per film. Marcus Theatres - Kids’ Dream Summer Film Series - Every Sunday, Monday, and Wednesday at 10am. June 15th through August 13th. 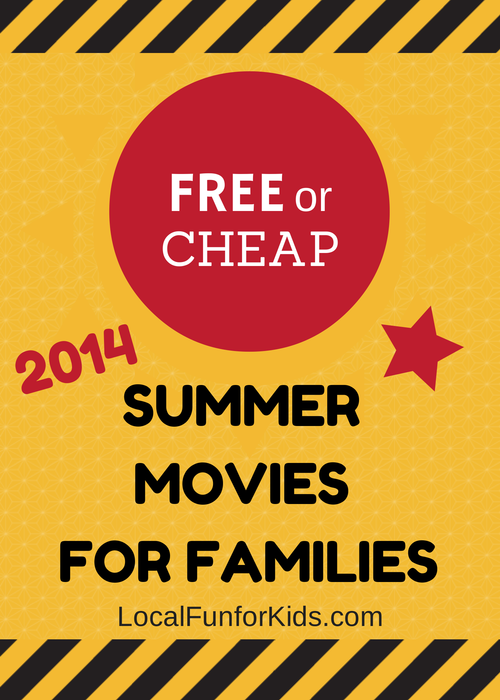 Family friendly films for just $2! The Majestic - Vero Beach, FL - Free films, seven days a week, all summer long! Every day at 10am. Children are FREE. Adults are just $2 or FREE with a donation (see site for details). Marquee Cinemas - Kid's Summer Movie Series - Marquee Cinemas presents a special selection of family films brought to you each week during the summer at no charge. Philadelphia Waterfront, Screening Under the Stars – Throughout the summer, you can watch different films outdoors on a big screen at Penn’s Landing. Bring a blanket or a lawn chair and enjoy a great summer treat! Regal - Summer Movie Express - Family movies will play every Tuesday and Wednesday for just $1 admission. Showcase Cinemas - Every Wednesday at 10:00 a.m. through August 3th, just bring a book report (see site for details) with you to the select Bookworm Wednesdays movie and that’s your price of admission! Keep in mind, all of these summer movie listings are subject to change. I always suggest contacting your local theatre to confirm details. These events tend to be very popular and are often issued on a first come - first serve basis. Go to the movies and have a great summer! Any parent who has ever had a child play hockey knows that it can be a huge investment of time and money, so you really want to make sure your child is committed before signing up. A couple of years ago, my son begged us to play hockey. My husband and I let him give it a try, only to find out that it wasn't his cup of tea. Over time, he has found other sports which he loves, and now enjoys watching hockey games from the sidelines instead. Does your son or daughter want to try playing hockey? Thanks to the Try Hockey for Free program, your kids across the U.S. can have a free hockey session before you take the leap to skating lessons or team sign ups. As part of the NHL's Come Play Hockey Month, ice rinks across the U.S. will be hosting programs for kids to try hockey for FREE! This is a great opportunity for your child, between the ages of 4 to 9, to get on the ice and learn more about the sport. These FREE hockey trial sessions will take place on Saturday, March 1, 2014. To learn more and find a location near you, go to the Try Hockey for Free website. All locations have a limited amount of equipment available for use so you will need to register as soon as possible. What do DIY Juggling Balls have to do with Chick-fil-A and you? Chick-fil-A has partnered with the Barnum and Bailey Circus to promote their new Legends tour and they may be stopping in your town soon. 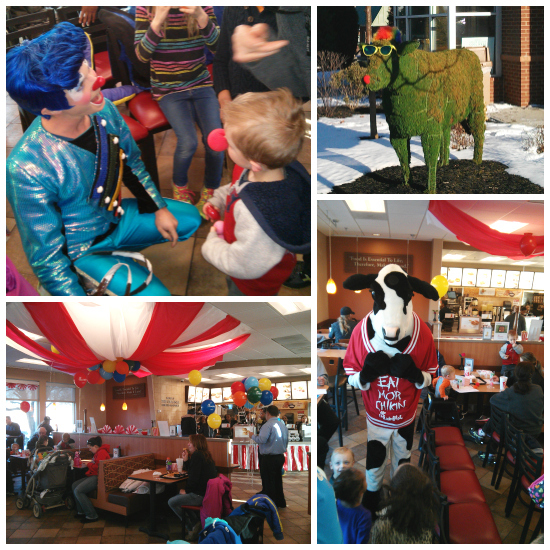 I had the chance to meet two very sweet clowns at Chick-fil-A in Lima, PA, and they certainly knew how to warm our spirits on such a bitter cold day! The Chick-fil-A, in Lima, set the scene by decorating the entire restaurant. There was a red and white canopy, lots of colorful balloons, crafts, contests, and red clown noses for everyone! The cow, outside of the restaurant, was even dressed up with a clown wig, red nose and sunglasses. There was so much excitement in the air! 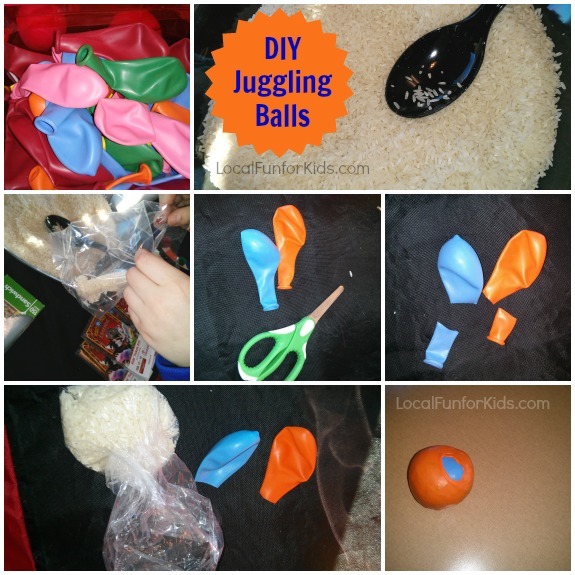 While the kids waited for the arrival of the clowns, they kept busy by eating chicken and doing crafts, including these really cool DIY juggling balls. 1) Fill up a baggie with about 1/3 cup of rice. 3) Smoosh up your baggie (filled with rice) into one balloon. 4) Then, take that balloon and squeeze it into a second balloon. 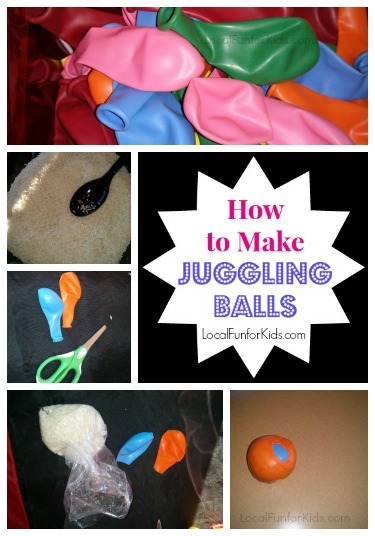 Those are the simple steps for making juggling balls at home! Here's a video of the clowns performance at Chick-fil-A. Keep an eye out! Maybe they'll be coming to your town soon. If you're in the Philadelphia area, the Barnum and Bailey circus is coming to the Wells Fargo Center from Feb 12 through the 16th. Use the promo code “BLOG” to get tickets at a discounted rate. Thank you to Chick-fil-A in Lima, PA for giving all the local moms somewhere to take their kiddos on a chilly Thursday afternoon. My son and I loved it and are looking forward to future events! On January 7th 2013, children between the ages 6-14 are invited to a local LEGO® Store to learn how to build a Snowplow model. They will be able to take home their mini model for FREE! The event starts at 5pm. Read more about the LEGO® Mini Model Event Here. Note: Quantities are limited and offer is good while supplies last only. One free model per child. It's FREE breakfast time! I just found out that participating Chick-fil-A® restaurants are giving away one of a variety of complimentary breakfast entrées from September 9th through September 14th. In order to participate in this deal, customers will need to make a reservation online. Search here for a Restaurant near you to get started. Subject to the Official Rules. Growing up with my sisters, I never thought twice about baseball. We played sports throughout childhood, but weren't particularly "sporty." An afternoon at a baseball field would have felt like torture, but, it's amazing how being the mom to 2 boys has completely changed me. Over the past few years, my sons have grown to love baseball, and my husband and I are along for the ride with our hands held high! Our local MLB team is the Philadelphia Phillies and there are a million reasons to love them. There is no doubt that going to a Phillies game is exciting, but, sometimes less is more. When it comes to Minor League vs. Major League baseball, I have to admit, I have a soft spot in my heart for the minors. The kids can actually see the players. When you're at a smaller stadium, there really isn't a bad seat in the house. This is great for younger kids who tend to lose interest more easily. When they can actually see the players up close it helps to keep them focused on the game. I get to enjoy myself too! I don't feel overwhelmed by taking my kids to a Wilmington Blue Rocks baseball game. As a parent, it can be stressful going to over-crowded places where I could blink and lose my child. However, the local Minor League stadium is smaller which makes everything easier and more fun. The free parking is just steps away from the main gate. Finding our seats is a piece of cake, and the bathrooms and concessions are all extremely convenient too. The tickets are a fraction of what it would have cost to go to a Major League game. We're on a budget and family entertainment can add up fast. My family had 6th row tickets to the minor league game and it only cost about $50 for the entire family. That's a great price for a night out with the family! Minor League baseball games tend to be very family oriented. I've seen moon bounces, clowns, and on-field entertainment throughout the game to keep the kids entertained. If my husband and eldest son are glued to the game but my younger son loses interest, I can just stroll around the stadium with him and find other things to do. Often times, we even see people we know, which makes it more fun too. Overall, it's a much more relaxed setting, which is great for families of young children. Have you ever been to a Minor League Baseball game with your kids? Will you be watching some baseball games this summer? Click here to find a Minor League game near you. Wondering how to keep the kids busy this June? There are lots of fun local events happening all around the U.S. and I've been keeping track of everything on Local Fun for Kids Calendar. All of these events are free or very inexpensive and make it easy to fill up your calendar with fun things to do for June 2013. For exact dates, times and other specific information, just click on the title of each event. Did you know that Bank of America or Merrill Lynch credit/debit card holders get FREE admission to more than 150 museums nationwide with the Museums on Us program? This program takes place the first full weekend (Sat & Sun) of each month, which means that this weekend, June 1st and 2nd , get free general admission to select museums with your photo ID and with your Bank of America or Merrill Lynch credit or debit card. 2) Free Craft at LakeShore Learning - Saturday, June 1, 11am – 3pm - Kids can make a High Flying Sky Diver! "This super exciting crafts lets young parachutists take their imagination sky high... and dive into fun." 3) Free Redbox Rental at Kroger - Sunday, June 2nd - Kroger & affiliate locations are offering up 1 FREE Redbox movie code every Sunday through June 16th! 4) Lego Mini Model Build: LEGO Fisherman - Tuesday, June 4, beginning at 5:00 pm (until supplies last) children ages 6 to 14 are invited to the LEGO Store and learn how to build a special LEGO model - then take that model home, for FREE! 5) National Doughnut Day is Friday, June 7th 2013 - Krispy Kreme would love you to come and celebrate with them with a free doughnut! Participating Dunkin' Donuts restaurants nationwide will offer guests a free donut of their choice (while supplies last) with the purchase of any beverage. Come to Pottery Barn and celebrate World Oceans Day! Kids will learn all about the ocean and it's marine dwellers at this FREE event. 8) Free Craft at LakeShore Learning - Saturday, June 8, 11am to 3pm - Kids can make an Under the Sea Porthole! "Kids make a porthole to frame an awesome ocean scene filled with stunning sea life." 9) Juneteenth Celebrations Across the U.S. - Wednesday, Jun 19, 2013 - Juneteenth is the oldest nationally celebrated commemoration of the ending of slavery in the United States. From its Galveston, Texas origin in 1865, the observance of June 19th as the African American Emancipation Day has spread across the United States and beyond. 10) Build a Monsters University Chest at Lowe's - Saturday, June 22 & Sunday, June 23 - The monster fun continues at Lowe’s this weekend! 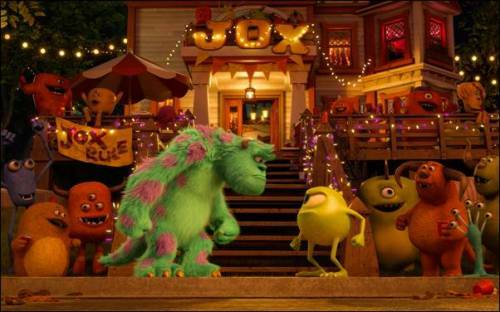 Your child will love building this chest inspired by Disney•Pixar's Monsters University. REGISTRATION OPENS ON JUNE 5th. 11) Simply Spray® Canvas Bag project at AC Moore -Wednesday, June 26, 1pm to 3pm - On June 26, shoppers at all 139 A.C. Moore stores can purchase a canvas tote bag for $1. All monies raised through the sale directly benefit Alex’s Lemonade Stand Foundation. From 1 p.m. to 3 p.m. kids can use Simply Spray® to create a special design on their tote bags for free while learning more about holding their own lemonade stands in support of Alex’s Lemonade Stand Foundation and pediatric cancer research. Lemonade stand projects can be found at the A.C. Moore website, www.acmoore.com. Shoppers can also donate to the foundation via the purchase of paper “lemons” at checkout. 12) Kids Bowl Free - This program is designed by bowling centers to give back to the community and provide a safe, secure, and fun way for kids to spend time this summer. 13) Kids Skate Free - Do you want your children to get out of the house and get active? Many local skating centers are offering FREE admission each week throughout the summer. 15) Regal Summer Movie Express is here! Each Regal Movie Theatre location will host the Summer Movie Express on Tuesdays & Wednesdays at 10am for nine weeks. Admission is $1 and a portion of the proceeds will benefit the Will Rogers Institute. + Check the Local Fun for Kids Calender for more summer events! Have anything else to add to the list? Leave a comment below or send me an email. Note: These are pre-scheduled events and are subject to last minutes changes and cancellations, please always call or check the site to confirm. The 2013 USA Sevens Collegiate Rugby Championship is coming to the Philly area in June! The tournament is taking place June 1st & 2nd at PPL Park (home of the Philadelphia Union Soccer team) right outside of the city. The tournament will feature 20 of the nation’s top college teams, including local schools Penn, Temple, Delaware, Penn State, St. Joseph’s, and Kutztown. Throughout the 44 matches in two days, the teams will strive for the championship title and the sought-after Pete Dawkins trophy. This tournament has a reputation for being the most prestigious college rugby tournament in the country, and it looks like a fun-filled, action packed event.